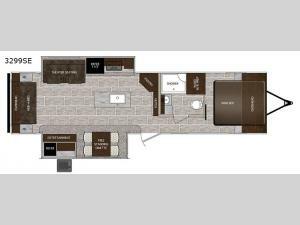 This is the model of doubles...from dual slide outs to two kitchens (one inside and one outside), you will love all of the modern comforts and conveniences found throughout this LaCrosse travel trailer. Just imagine preparing meals at the kitchen island with a stainless steel sink, getting dry goods and snacks from the unique and large corner pantry, cooking in the convection microwave, and grabbing a drink from the 11 cu. ft. residential refrigerator. If you want to spend more time outdoors with your family then you will appreciate the handy outdoor kitchen cook center, plus there is a 12'6" electric awning which provides plenty of shade from the sun and maximizes your outdoor living space. You can sleep on your king size bed in the private bedroom while your two guests share the hide-a-bed sofa in the rear living area. Come see other features you will not want to camp without! Wherever your camping adventures lead you, you will want a luxury LaCrosse travel trailer. Throughout each model you will find attention to detail from the solid hardwood cabinet doors, single bowl stainless steel sink, and residential J-spout kitchen faucet to the electric adjustable awning. You will find upgraded residential carpet with a pad, and in the living room there is an exclusive oversized MAX slide out offering nearly 40 cu. ft. of additional living space. MAX protection is found in the exclusive ETERNABOND construction which includes an enclosed and heated underbelly plus enclosed heated holding tanks and more. The mandatory Advantage Package includes the following - Universal Docking Center, electric tongue jack, frameless windows, a Furrion residential cooktop, solid surface countertops, a large stainless steel refrigerator, and so much more!